Thank you for your interest in Modular Belt Conveyor Incline. We will be happy to discuss the pricing in more detail with you please fill in your details below and somebody will contcat you back with a quote. 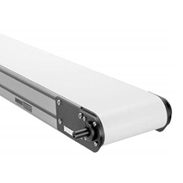 Alternatively please call us on 01772 690656 and please reference our part number - Modular Belt Conveyor Incline. Modular belt conveyor inclines are becoming increasingly popular. As the belt technology develops, the price also becomes more competitive and the modular belt design is now often preferred to PVC belts.